- From ‘Le Clarillon de Vendôme’ a 15th Century nursery rhyme and believed to be France’s oldest folk song. Its melody echoes the peel of the bells of the church towers at Vendôme and Beaugency. With only a handful of growers active in these two appellations, a listing of the ten top producers and their wines is not possible. Also, the style of the wines ensures that these are generally consumed within the year following the vintage, so listing the best wines would make any list out of date as soon it was published. As an alternative, I offer the following appraisal. The city of Orléans has always been a place of historical importance. It is situated at the Loire’s northern-most point and at the closest position to Paris for those needing to traverse the river on their journey to the capital. Over the centuries is has prospered through the level of trade that passed through the city, but has also been a victim in times of conflict due to its strategic location. It sits some 130km south-west of Paris in the département of Loiret, and on the edge of the administrative region of Centre, of which it is the capital. Apart from its rich history, it is today a busy commercial centre, a city of 113,000 people. Away from the city to the north, one enters the flat cereal prairies of La Petite Beauce, whilst to the south of the river, the climate seems more clement and the agricultural focus changes; the southern Loiret being famed for the quality of its asparagus and of its orchard fruits: apples, pears, cherries and hazelnuts. The roads running south from Orléans are lined with nurserymen and market gardens. This is the true Jardin de la France. Unfortunately, the local wine growers do not seem to command the same respect and recognition, bearing the brunt of many a joke, in that Orléans was, for 500 years, the capital of France’s vinegar production. More recently, however, the controversial elevation of its microscopic vineyard plantings in November 2006 to receive not one, but two separate Appellation Côntrolées, at a time when pressure is being applied to the authorities to simplify France’s wine laws, has at least brought this somewhat neglected and misunderstood region back into the spotlight. The obvious question is why were there two appellations created when one might have sufficed? It’s the first thing I queried myself in researching the region for this report. The answer is quite simple and, I have to concede, justified. 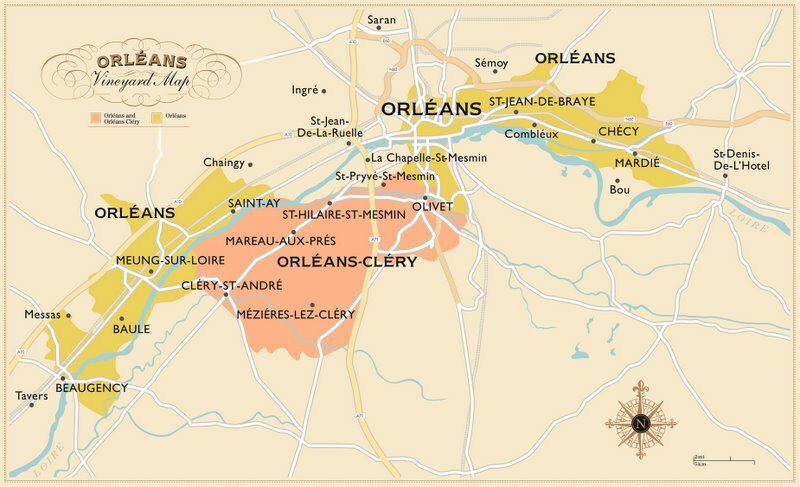 Although there is an absolute overlap in the geographic location of the current plantings, centred on five communes, the appellation of Orléans-Cléry is dedicated to wines produced from Cabernet Franc, this variety playing no part in the blending of the other red (and rosé) wines produced from Pinot Meunier and Pinot Noir for the generic Orléans AC. Whilst I can appreciate that this might only create confusion within an already marginal appellation, it seems to be the most sensible decision. Whilst Orléans might be at the heart of commerce in the Centre region, its local wine growers plough their own path, belonging to neither of the generic wine marketing bodies of the Bureau Interprofessionel des Vins du Centre (BIVC) or InterLoire, who represent the interests of the growers of Touraine, Anjou-Saumur and Pays Nantais. Rabelais might well have once compared the wines of Orléans to the best crus of Beaune, but today without any significant voice to promote their wines or the presence of négociants working within the region to help widen the awareness and distribution, the two appellations of Orléans and Orléans-Cléry are set to remain little more than relatively undistinguished local curiosities. Cenabum existed as a Gallic stronghold and a centre for the Carnutes tribe long before Julius Caesar conquered and razed the settlement in 52BC. The city was rebuilt during the reign (between 270 – 275) of the Emperor Aurelian, proclaiming it Aurelianum which, over time, evolved into the name of Orléans. By the 10th or 11th Century it had become the most important city in France after Paris, primarily due to its strategic position on the Loire. The first evidence of vineyard plantings dates back to the year 510 with the establishment of the Benedictine monastery of L’Abbaye de Micy at Saint-Pryvé-Saint-Mesmin, now a suburb of Orléans on its rive gauche. Gregory of Tours, a significant source of documented history relating to wine wrote, sometime between 576 and 584, in his Historia Francorum that merchants looking for large supplies of wine had turned to Orléans for their business, so suggesting that vineyards were already fully established during the late 6th Century. Charlemagne (742 – 814) is said to have developed a clos in Saint-Euverte, a suburb of Orléans, which carried his name until it was abandoned in the 19th Century, due presumably to urban encroachment, or the onset of phylloxera. Documents dating from the 11th Century show that vines extended in a continuous cordon along the banks of the Loire from Châteauneuf-sur-Loire to Beaugency and as far north as Rebréchien, some 8km north of Orleans. At the same time, the vineyards of Olivet and Saint-Hilaire-Saint-Mesmin were said to be better known than those of Burgundy and Bordeaux. In order protect the good reputation of Orléans and to prevent fraud, the wine growers – and by now, vinegar producers - began to form Guilds to help secure their industries. In 1394 the vinegar makers had formed the Corporation des vinaigriers, buffetiers, sauciers et moutardiers d'Orléans, their Guild being officially recognised by Henri IV, exactly two hundred years later, in 1594. In the mid 14th Century Orléans had become the centre of the Royal Duchy following its establishment by Philip VI in 1344. During the One Hundred Years’ War (1337 – 1453) the city was besieged by the English at the Siege of Orleans in 1428, before being famously liberated by Jean d’Arc in April 1429, after which she was forever adopted as la pucelle: the Maid of Orléans. By the 15th Century the vineyards around the city and along the adjacent banks were as established as those of Bordeaux are today. In Renaissance France, the city became the fashionable gateway for touring the royal domains of Chambord, Blois, Amboise and Chenonceaux, with les vins orléanais being poured on noblest tables. By 1610 these vineyards had become the most populated in the world. This followed a decision, in 1577, by the Parliament of Paris to promulgate a law forbidding the purchase of wine produced from any area within 20 leagues (88 kilometres) of the capital. To respond to demand, production around Orléans was increased (at its peak it was believed that there were around 20,000 hectares of vineyards in production), but this was largely of cheap, table wine and the reputation of Orleans’ vineyards collapsed in the 17th and 18th centuries as a result. The advent of phylloxera in the late 19th century then dealt a nearly fatal blow to viticulture as a whole. Within the past century, the wine industry has existed rather than flourished with the vineyards only starting to regain any recognition after the Second World War. The wines were awarded V.D.Q.S. status in 1951, some twenty years after the main wine co-operative in Mareau-aux-Près was established. The co-op was built to accommodate 21,000 hl of wine and was, apparently up until the late 1960s, always full. Today, it vinifies less than a quarter of its capacity and yet is still responsible for about three quarters of the region’s viticultural output. A second wine co-operative operated by Covifruit, closed its doors in 1998. Orléans and Orléans-Cléry have enjoyed full Appellation Côntrolée status since 23rd November 2006. The vineyards are set at the point where the river diverts from its south to north axis and begins to flow from east to west. During the last Ice Age, some 10,000 years ago, the land here was submerged under a shallow, frozen sea. Prior to this the Loire had taken a different course, directly north, joining the Seine and flowing out into the English Channel. After the thaw, the river changed its course to the one we know today, out into the Atlantic. The region of the northern most point of the Loire is dominated by continental weather patterns rather than maritime influences, and this is justified in the selection of grapes found here; primarily the Pinot family, which including Chardonnay, are better suited to continental growing conditions. As a result, the wines of Orléans draw their influences more from Burgundy and Champagne, and one could view their inclusion in the Loire region as a whole as little more than coincidental. In addition, if one considers the history of the region and its influence whilst under the control of the Dukes of Burgundy, it is understandable why the Pinot family has been the dominant force for so long. The arrival of Cabernet Franc in the region is more recent, probably in the 17th Century, which would be contemporaneous with its arrival in Touraine. The legislation of November 2006 specifies that there are 13 communes entitled to the Orléans appellation. Of these, nine are situated on the right bank of the river, although in reality the vast majority of plantings are in the five communes that lie on the rive gauche, just a few kilometres downstream from the city itself. These sporadic parcels are found on a low plateau which runs from east to west, with the only evidence of any continuous plantings being located on an undistinguished north facing slope in the village of Mareau-aux-Près. The five communes that are entitled the appellation of Orléans-Cléry are the exact same villages that claim the generic Orléans AC; the only difference being that the vineyards are planted with Cabernet Franc. Consideration is given to the type of soil planted to the various varieties although this is not enforced by the appellation laws: Meziers-lez-Cléry has more sand and clay and is better suited to Pinot and Chardonnay, whilst Saint-Hilaire has more limestone. Cabernet Franc is better suited to sites around Mareau–aux-Près and Cléry-Saint-André where the soil is mainly sand and gravel over limestone. Gris Meunier, as it is known locally, is the oldest and most widely planted variety in the region and one of the very few appellations where it is vinified as a red wine. It is generally more precocious during the growing season than Pinot Noir and delivers very small yields. It is sensitive to pourriture gris and difficult to grow. A total of 50 hectares of Pinot Noir and Pinot Meunier combined are planted within the Orléans appellation. It is the dominant variety in the production of both red and rosé (either through maceration or direct pressure) and normally accounts for between 70% and 90% of the final blend. Pinot Noir is known locally as Auvernat Rouge and it is believed to be the original variety grown in the region. Within the vineyard, Pinot Noir can ripen and be co-harvested with Pinot Meunier (as with the 2006 vintage), but there is no set pattern and some years one can be later than the other, as with Pinot Noir in 2008 when it was first to ripen. Pinot Gris permitted for use in rosé and has been available within the region for a long period of time, yet only one grower, Clos Saint-Fiacre, chooses to exploit it. They have a total of 1.7 hectares planted with the variety. This is known locally as Auvernat Blanc and with only 21 hectares planted through the entire Orléans appellation, white wines are in the minority within the region. Cabernet Franc is permitted for use in the appellation Orléans-Cléry only. The variety probably arrived here at the same time as in Touraine and historically it has only ever been planted on the south side of the river. It is known locally as Noir. Tolerated in Orléans-Cléry to maximum of 25%, although no one appears to have any planted and it is due to be outlawed in the Appellation after 2020. Permitted for the local Vin de Pays. Permitted for the local Vin de Pays, although it is widely planted. A minimum of 5,000 vines per hectare, planted not more than 2 metres between the row and 1 metre within the row with Guyot simple being the permitted trellising system. This is the same for both appellations. Very good quality, although there was some localised hail. Two growers harvested at just 20hl/ha and 30hl/ha due to the damage caused by a late frost. Frost in May posed a threat. Otherwise a dry vintage. A small crop following an unexpected and very late and localised frost on the 1st June. Some growers lost 50% of their production. Very good quality and volume. Hubert Piel failed to harvest this vintage due to pourriture.